Perhaps it's true what they say about the relative merits of being the hunter and the hunted. Perhaps his boss Toto Wolff is correct when he commented a few rounds back that his charge is at his best when he has something to fight against. Certainly we have plenty of evidence accumulated over time that suggests so too. Certainly now he's in last chance saloon his shooting is at its very sharpest. 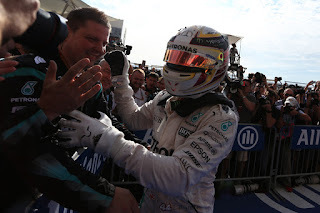 "It's always a tough battle obviously trying to pull out the perfect laps when it counts is always the difficult thing, particularly with these tyres", Lewis said afterwards, reflecting things of which there was no clue on the outside. And all the while his team mate struggled to take the same advantage. 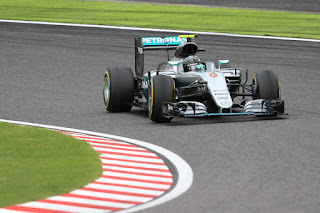 Rosberg hadn't really shown up much on headline lap times at any point, something his team put down to traffic and engine modes. But even as business got critical in qualifying he lingered for the most part still shy of the Red Bulls and a few others indeed and the gap between the Merc pair was a whole six tenths in Q2. Then after the opening runs of vital Q3 Nico remained in fourth behind the Bulls and yet was around half a second off his stable mate. We wondered too if there was something bigger going on, and not just that Nico's run of getting into the top two of qualifying every time going back some 24 rounds seemed under threat. Earlier in this campaign the conventional wisdom around was that he would tighten up with the pressure of an impending title. We then thought after his fine dominant performances in Singapore and Japan that things could be different this time. Now though the thought occurred, was this happening after all, just delayed? It couldn't, could it..? It couldn't. Well not for now at any rate. At the very last things changed, and it changed indeed when just like 12 months ago it appeared a change in track temperature would preclude improvement from anyone in the second Q3 runs. Nico with everything against him effected a save and scavenged P2 - still a quarter of a second off Lewis's best but a source of major relief no doubt nonetheless. This leaves him still on course for the title. Just as he has for most of the season Nico if nothing else has been dogged and defied all of that conventional wisdom mentioned, particularly in leaping back to life when all were counting him out. Nico remained frank afterwards though. 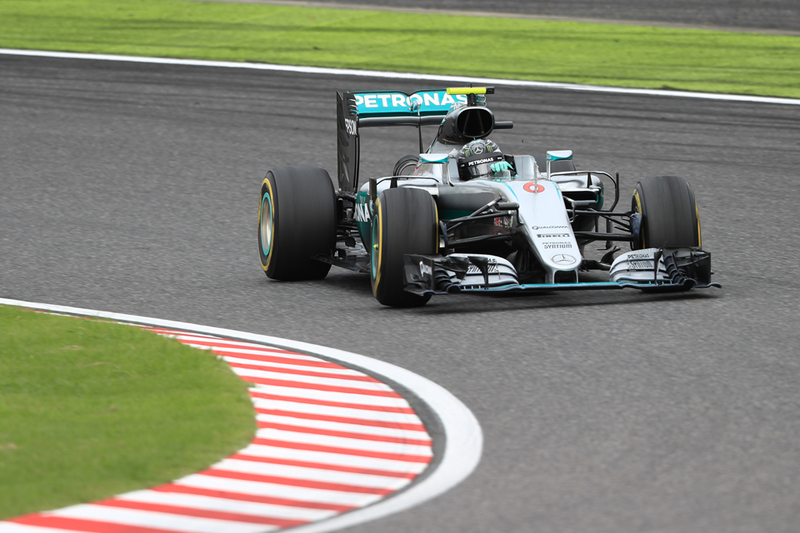 "'Brilliant' is two and a half tenths from Lewis" he said when someone described his late effort thus. "Lewis's lap was brilliant, not so much mine. I put it together when it counted in the end...It took just a bit longer this weekend to find a way. Just generally with tyre temperatures with them being on the cold side all weekend, so it's a bit nervous out there..."
Perhaps it gets better for Nico too, as the Red Bulls behind start on supersofts tomorrow rather than the softs that both Mercs will have. It's reckoned starting on the soft opens the possibility of a one-stop strategy, while in sharp contrast the consensus is the gumball supersoft will last four or five tours only. Then again we thought the same thing last week in the same scenario in Austin, and in the event strategies were almost identical. Nico will know better than anyone that the Bulls on softer tyres will be in a position to attack early. The run to turn 1 - and the Red Bulls should also get a better launch from their softer tyres - is four times longer than in Austin. He'll also be starting on the dirtier side of the track. 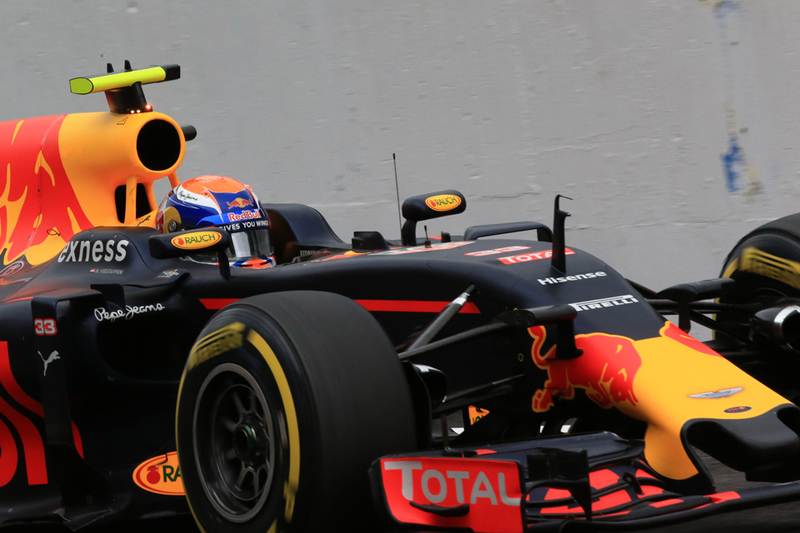 Red Bull boss Christian Horner was insistent after quali they felt the supersoft was a better way for the race. Strategy was a matter Nico mused over afterwards. "The supersoft, it will be okay to start [the] race [on] but it disintegrates pretty quickly, so in terms of strategy that is definitely a disadvantage. We think our strategy is a better one," he insisted. For Lewis the considerations also seem close to identical to those a week ago - and just like then most things will hinge on the first few seconds. If his start is a good one he likely won't be seen again; if it isn't as has often been the case this year it could well ruin his day immediately, as well as have probable implications for his championship chances (and for the reasons given a poor start will be punished ruthlessly here). "Going into tomorrow we have the right strategy and the car in a good place for the long runs," Lewis noted though with some sangfroid. The Red Bulls still were next up in P3 and P4 with Verstappen ahead. Daniel Ricciardo expressed relief to bag fourth after a "weird and confusing" qualifying related to the mile-and-a-half altitude and its impact on grip. "I thought it was a pretty terrible balance," he went on, "even on the last lap I don't know how I went quicker - I think I was four tenths slower than my previous lap by turn 6...when I see pole is four tenths away - we missed that in the first sector even. It's tricky out there." Max too thought more was possible after "in Q3 we couldn't get the lap together, otherwise I think P2 was definitely possible." Bewilderment in Q3 seemed another consistent theme - indeed as we witnessed last year here this seems a track not only short on grip generally but also one that seems particularly sensitive to temperature shifts. This time it was by one degree literally prior to Q3, and it seemed enough. It even impacted on our pole man. 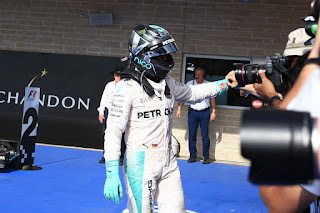 "Long runs we were really strong and practice was really good, so Q3 was actually the worst session of the whole weekend so far," Hamilton noted. Ferrari continued the theme of things returning to normal in the end of Mexico's qualifying. As noted for much of this weekend including the early part of quali it looked like it could be experiencing a renaissance. But in that achingly familiar way for this campaign in the final order this was dashed and instead you had to search for the red cars in the order. 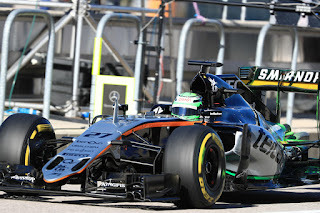 They had sunk to P6 and P7, behind not only the usual suspect Mercs and Bulls, but also Nico Hulkenberg's Force India. Kimi Raikkonen apparently had an engine problem while Sebastian Vettel's problems were all to do with handling, which he described on his cool down lap as "horrible". He later spoke of how the car felt better on the soft tyre in Q2 than on the supposedly quicker supersoft later. That's not to take anything away from the Hulk, who since his Renault move for 2017 has been announced has found some of his urge of old it seems. 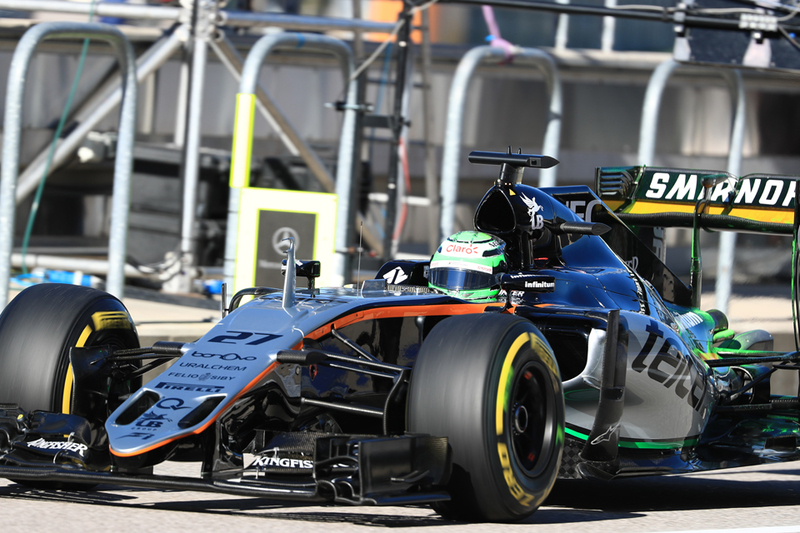 His team mate Sergio Perez meanwhile slunk out in Q2 at home after a mistake on his final effort, and starts twelfth. In another familiar theme the Spanish pair made the very best of things. Carlos Sainz once again performed an act of wonder to get his down-on-power Toro Rosso into the top ten on this power track, while Fernando Alonso was delighted to get P11, which given the tyre considerations outlined many reckon is better than a few places in the lower part of the top ten. For Lewis out front though, just like a week ago the considerations (or should that be the singular 'consideration'?) remain simple. "There is no real tactic. Turned up to do the job, and I'm going to try and do the same thing as I did last week here." Thus far he's on course.